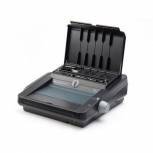 GBC WireBind W25E Electric Punch Wire Binder 4400427 Pack of 1 Electric wire binding machine punches up to 25 sheets and binds up to 125 sheets (14mm). Features Electric punching, foot pedal for hands free punching, empty chip drawer light, wire closure control and SimplyClick wire selector. Non returnable. 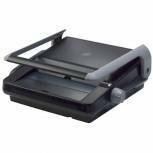 Fellowes Quasar Manual Wire Binding Machine 5224101 Pack of 1 Wire binding machine with adjustable paper stop, vertical sheet loading and storage tray with patented wire selector. Punches up to 15 sheets and binds up to 120 sheets with a maximum comb size of 14mm. 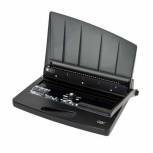 GBC WireBind W15 Wire Binder 4400402 Pack of 1 Compact and stylish wire binding machine ideal for light office use and desk top binding. Features simple and easy to use controls and easy access clippings tray. Punches up to 15 sheets and binds up to 125 sheets (14mm wire). GBC WireBind W20 Wire Binder 4400426 Pack of 1 GBC W20 wire binding machine punches up to 20 sheets and binds up to 125 sheets (14mm). Features Flowline Pro paper and auto centring, easy access to clippings tray, double handle and SimplyClick wire selector.